Looks like Spring is finally here! To kick off the warmer weather, I'm introducing a new series on my blog, featuring the perfect little bites and sips to enjoy outdoors on the patio. Canadians really look forward to the warm weather and we try our best to enjoy every day of sunshine and high temperatures that we get. The patio culture is huge, but if you are always dining out, it can really take a toll on your health and your wallet. So I thought I'd share some quick and easy recipes that you can make at home to enjoy in your own backyard (or on your balcony) all spring/summer long. This is the perfect drink for a post-run or post-yoga refresher. Or perhaps this is a little breakfast replacement for you. Either way, it's super simple, stunning and delicious. I should also mention that this recipe can be easily made vegan by omitting the yogurt. Watch this video to see how I make my Mango Smoothie and two beautiful ways to present it to your friends. You can also find the recipe below. 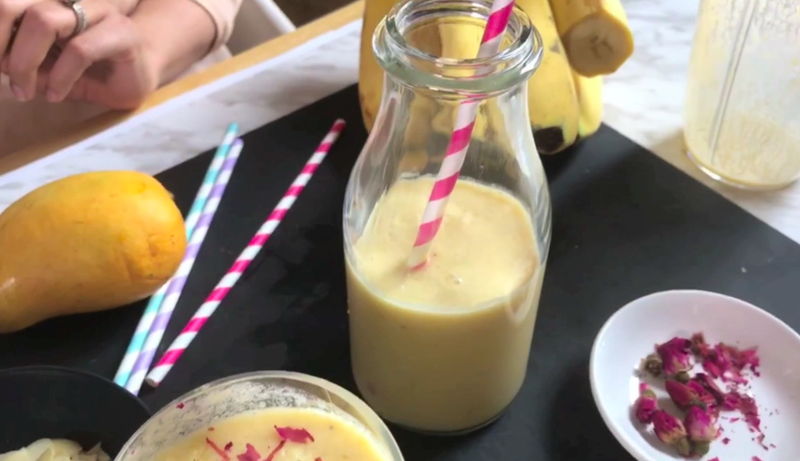 Blend the banana, mango, ice, milk and yogurt until it is smooth. Pour into a glass and serve! Watch the video above for some presentation inspiration! Wishing you all a fabulous patio season ahead! Science has proved that healthy weight loss, healthy intake and fitness routines build dramatic enhancements in health, and facilitate management common chronic sicknesses like high stroller, high vital sign, diabetes, stress, and general lack of stamina.